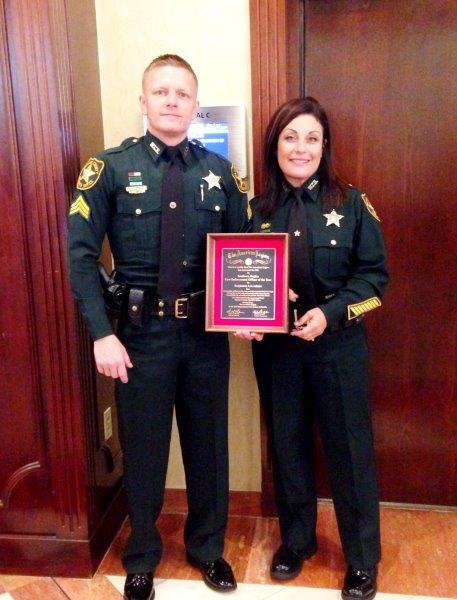 Official Press Release – Marion County Sheriff’s Office Crime Prevention Supervisor Sgt. Ben Adams, has been selected as the American Legion’s Southern Region Law Enforcement Officer of the Year. This award recognizes those officers who have selflessly distinguished themselves over and beyond their normal duties, predominately through professional achievements and community service activities. Before Sgt. Adams joined the Marion County Sheriff’s Office in 2006, he was an active duty service member in the United States Marine Corps. He served in military police corrections and at the Marine Corps’ Headquarters of Law Enforcement from 1996-2000. He then joined the 351st Military Police Company as an Army Reservist and was deployed to Iraq in support of Operation Iraqi Freedom, from February 2003 to June 2004. While at the Marion County Sheriff’s Office, Sgt. Adams has served in patrol, the Drug Unit, Tactical Investigations Unit as a robbery detective, the SWAT Team, and has served in the Honor Guard. According to the sheriff’s office, Sgt. Adams has been instrumental in solving and preventing crimes in Marion County. In October 2013, Sgt. Adams acted as lead detective for the Tactical Investigations Unit on a robbery case at Love’s Truck Stop off Highway 326. The case was solved and Sgt. Adams and his fellow detectives recovered almost all of the money that had been stolen, which was close to $18,000. As the Crime Prevention Supervisor, Sgt. Adams visits with local businesses and residents daily, discussing new crime trends and how they can better protect themselves from becoming a victim. This award also recognizes Sgt. Adams’ involvement in the community: he is a lead pastor at New Life Family Church and is one of the founders of Alive Ministries. The National Law and Order Committee selects five winners, who represent the Southern, Northeast, Central, Midwest, and Western Regions of America. Out of these five, one will be chosen as The American Legion’s 2015 National Law Enforcement Officer of the Year.